How can Nigerians be protected from the annual floods? Nigerians are facing at least three months of battling against heavy rains that could lead to deadly, destructive flooding. At the beginning of July, the government warned that 30 of the country's 36 states could be at risk. 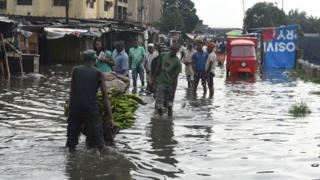 Already, 16 states, including the commercial hub Lagos, have been badly affected. Five years ago, the worst flooding in more than 40 years in Nigeria claimed 431 lives and displaced nearly two million people, according to the country's National Emergency Management Agency (Nema). BBC Africa's Ishaq Khalid explores the causes and what needs to be done to protect Nigerians from the scourge of floods every year. How bad is this year's flooding? The rainy season usually runs from July to September in Nigeria and every year it poses the threat of devastation and destruction across the country, claiming lives and destroying property. So far this year, several people have been killed across the country and hundreds of residential buildings, cars and other vehicles have been destroyed or submerged under water. Thirty-seven-year-old tea seller Sa'adu Abubakar, lost his six children and two wives when water poured into their apartment in the city of Suleja, just north of the capital, Abuja. "I held two of the children but I could not withstand the force of the water. The children slipped out of my hands," he told the BBC's Hausa Service. "I was just desperately praying to Allah at that moment. When the day broke, we found my family's dead bodies a short distance from our home." Another resident of Suleja told the BBC: "The rain started at 23:30 at night, we heard a loud 'boom'. Before I knew it, I was up to my neck in water. "We couldn't salvage anything... we have to save our lives. My house was well built but the water brought it down. "We need help. I haven't been able to cook food since yesterday and I'm living on the goodwill of other people." The tragedy in Suleja has once again highlighted the magnitude of the devastation caused by floods in Nigeria. Yet despite the yearly loss of lives and property, it seems that so far the country has not taken many concrete measures to tackle the disasters. Niger state in the north of the country has the highest number of casualties so far. Officials have confirmed that 15 people have died and many more injured. Other badly affected states are mostly in the south, near to the River Niger. Lagos has also been badly hit. Why is the flooding so bad? The frequency of the flooding differs across the regions, but the height of the rainy season tends to be from July to September, and it is often a time of anxiety for many communities living in flood-prone areas. Heavy rains, combined with poor drainage systems and blocked waterways cause rainwater to flow through commercial and residential dwellings. Town planning expert Aliyu Salisu Barau told the BBC that Nigerian authorities and ordinary citizens are ill-prepared for such disasters. "Tackling persistent flooding requires long-term planning," he said. "In most cases the authorities do not make provision to clear drainage systems until it is already rainy season," Mr Barau added. Nigeria's swelling population could make matters worse. Its currently home to 180 million people, and a recent UN report estimates that Nigeria will become the third most populous nation in the world by 2050, overtaking the United States. This could put pressure on land as the need for more housing rises. But it is the lack of proper town planning and the authorities' inability to accommodate these changes which causes most alarm. Some residents dump rubbish and waste in the streets, putting extra strain on the few existing urban drainage systems and preventing the steady flow of rainwater. Nigeria's many dams are also seen to be part of the problem. Used for irrigation and fish-farming activities, some are located close to towns and villages. But observers say these useful water reservoirs are poorly maintained and during the rainy season they can sometimes burst, releasing torrents of water into nearby communities. The Lagdo dam in neighbouring Cameroon, which is on the Benue river that runs through Nigeria, also poses a danger of heavy flooding in Nigeria when the Cameroonian authorities decide to release the dam's excess water. To add to the problem, the Nigerian authorities have very few arrangements for evacuating endangered communities - even in the face of imminent flood risks. And when warnings are issued they are rarely heeded by the least well off locals. Analysts say something concrete must be done to prevent the high death tolls seen in recent years. Destruction to property can be reduced by introducing effective town planning, respecting construction rules and regulations, and rooting out corruption in the building certification process. The number of fatalities and the impact on communities could be reduced if the authorities prepared themselves to forcibly evacuate those who are at imminent risk. Raising public awareness and encouraging people to become more aware of their urban environment are also key. Unless these practical measures are taken, experts say, floods will continue to destroy lives and property.